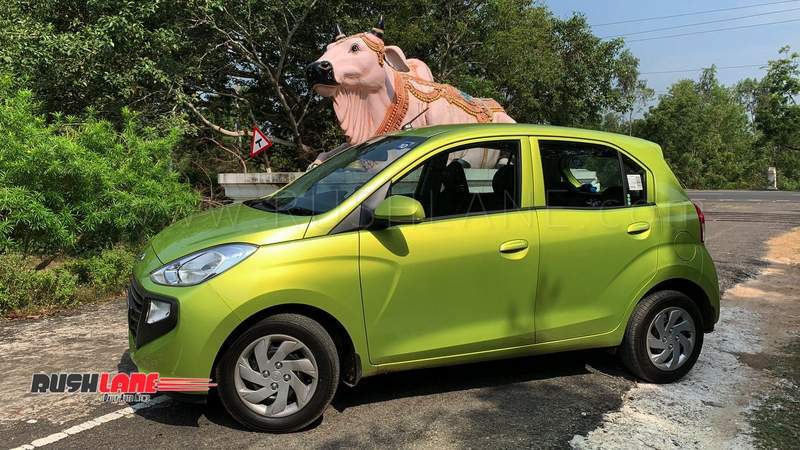 New Hyundai Santro test drive review - Is it better than rival Tata Tiago? 20 years, yes its been that long since we were introduced to the Santro brand by Hyundai. Hyundai`s debut in India was quickly a runaway success and the Santro went on to become India`s favourite family car. The market has matured a lot ever since, and the small car segment itself is further divided based upon the cost and features on offer. The Eon, Grand i10 and the i20 covered the small/compact /hatchback segment well, but the competition from the Tiago, Celerio left a small gap in the Hyundai`s portfolio. Enter Santro, voila – the perfect answer, or is it? 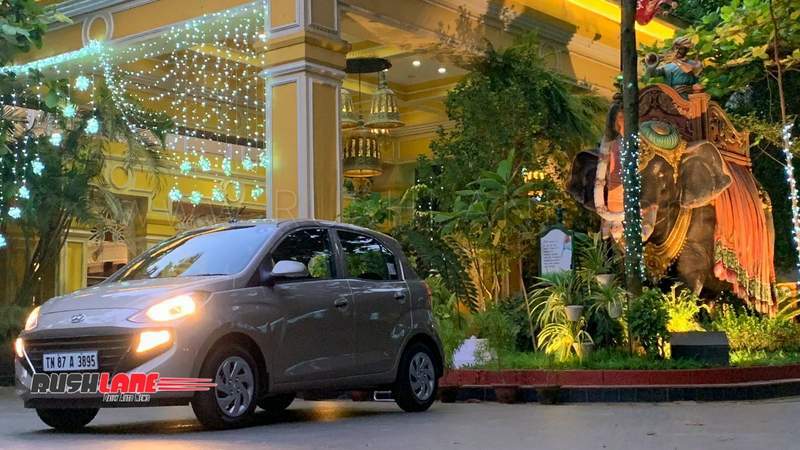 Design : The Santro had boots to fill, but the brief was simple – retain the USPs of the original Santro, refresh it with modern styling and top it with class leading features. The Santro, is just that, and lots more! When it comes to styling, the Santro inherits Hyundai`s modern design language like the distinct cascade grill at the front and plenty design cues from its siblings. The design is fresh yet neutral, nothing outlandish, not a plain jane either. Swept back head lamps, high placed fog lamps, “boomerang creases” on sides, kink in the rear door and a rather simple looking tail gate mostly sum up this attractive looking proposition from the Korean manufacturer. 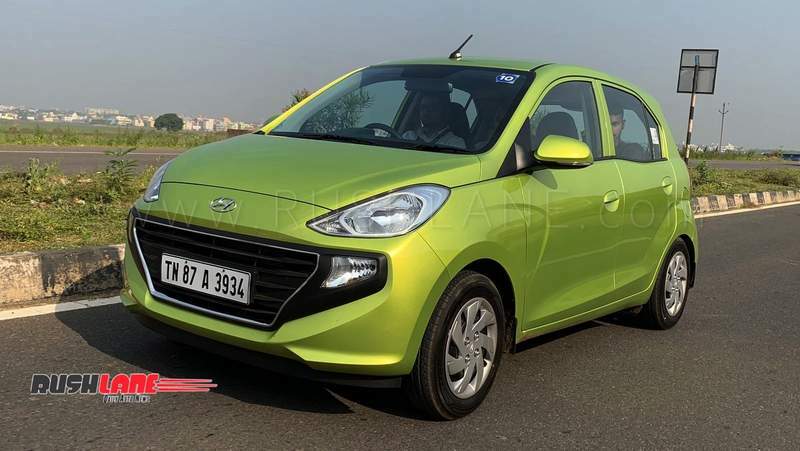 While the Santro is targeted at first time buyers as a family car, Hyundai does realise the aspiring young Indian buyer and has introduced a zingy looking Diana Green shade apart from Imperial Beige (another new shade) amongst the standard 5 body colours. Alloy wheels surprisingly, have been given a skip and are not available even as an option. The Santro has also stayed away from experimenting with DRLs (even the Datson Go has them) and any fancy LED treatment to the tail lamps etc. Insides : Fresh dashboard design with Elephant trunk inspired central panel and the propeller design aircon vents on the either side instantly catch your attention. The 7” touch screen infotainment system with rear parking camera and Android/Apple car play is a segment first and sets the Santro apart from the competition besides the de rigueur 12v socket and USB port. 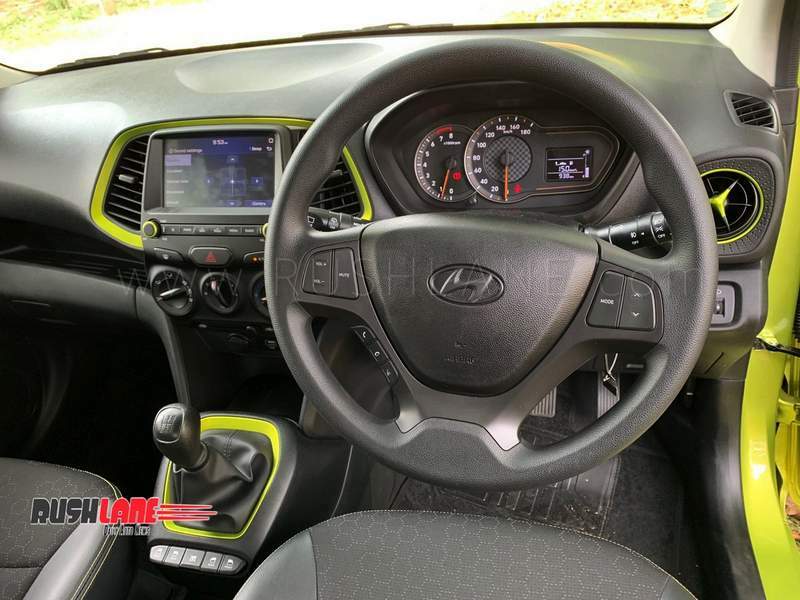 Look around, feel the surfaces and its clear that this car has not been built to a price, the build quality remains top class like other Hyundai cars. The Diana Green shade is the only unit which comes with all black interiors and body colour matching trim inserts around the air con vent and lime green front seat belts too! But we feel, the lighter beige interiors with rich Champagne gold inserts and highlights do a better job and keeping up the roomy feel of the cabin. The front power window switches have been relocated to the central console behind the gear shift stick and do need getting used to, but they make the door panels look tidier in bargain. The Santro also gets smart looking instrument cluster along with a 6.3cm Multi information display incorporating the twin trip, odo, distance to empty and tank range. The steering however, is relatively simple with the audio and telephony controls. 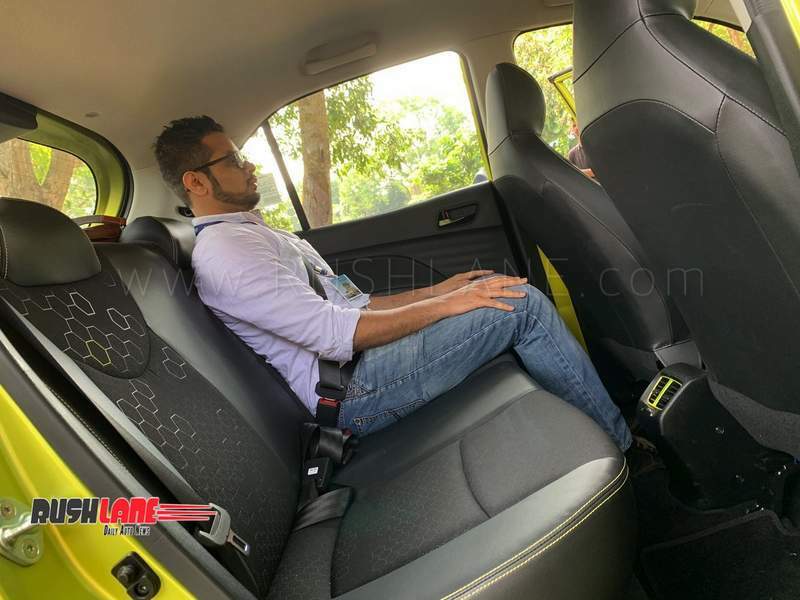 The rear passengers get pampered with split rear AC vents too, whats more, the rear bench is wide with ample lower thigh support and thank to the new platform, it boasts of a spacious 886mm of leg room. Hyundai claims that the rear seats have been designed to seat 3 passengers which we feel might be a bit of a squeeze. The seat back is a bit too reclined for our liking but the kink in the window helps in the overall airy feel of the cabin. Thanks to the potent 135cc compressor driven chilly aircon unit and the fantastic sounding 4 speaker audio passengers are likely going to have little to complain. Well well, all`s not rosy and Hyundai have skimped on many features in comparison to the competition which could be the reason behind Santro`s competitive pricing. Driver side seat height adjust, leather wrapped steering/gear knob, dead pedal (not even on the AMT), height adjustable steering, dedicated central locking button – these are missing even if you buy the top of the line Asta trim. Hows it to drive ? The Santro employs the tried and tested 4 cylinder 69bhp, 1.1 Epsilon unit from the i10 that makes 99Nm of torque. Step inside and the first thing one notices is the excellent visibility all around – this was one of the key briefing points while designing. Light clutch and typical Hyundai slick gear box make this car and absolute delight within city constraints. The AMT employs a first ever Electric motor driven clutch and gear actuator which is an absolute slick operator and functions brilliantly, while other AMTs on the market employ Hydraulic actuation. The upshifts and down shifts exude a smoothness of a new level with minimal lag and jerks. Hyundai has paid special attention to minimise NVH levels with clever application of sound deadening materials around the door, door pads, engine fire wall and the floor pan too resulting in a very quiet cabin. Premium Torque Only Sensor (PTOS) helps in significantly improving the returnability of the steering to Zero angle position while the suspension setup is nearly spot on offering a best of both worlds – ride and handling. ABS and EBD standard across all trims while dual front air bags are only offered on the Asta trim. The engine pulls cleanly from around 2000 rpm, but do not expect peppy acceleration, this is a very relaxed spinner with well matched gear ratios. On highways though, the engine needs to be worked up a bit to get good momentum and the unit gets quiet vocal in higher rpms spinning at around 3000 rpm @ 100 kph. Speaking of which, the Santro exhibits a very matured mannerisms even at speeds up to 120 kmph – something this car would not be seeing too often but would be happy do without making the occupants feeling uncomfortable. A simple warning ding reminds everyone once it crosses 80 kmph while an annoyingly repeated warning alarm at and above 120 kmph should deter one from pushing the car too hard. This is a safety feature which will be seen on all cars in India by 1st Oct 2019. Buy or not buy? 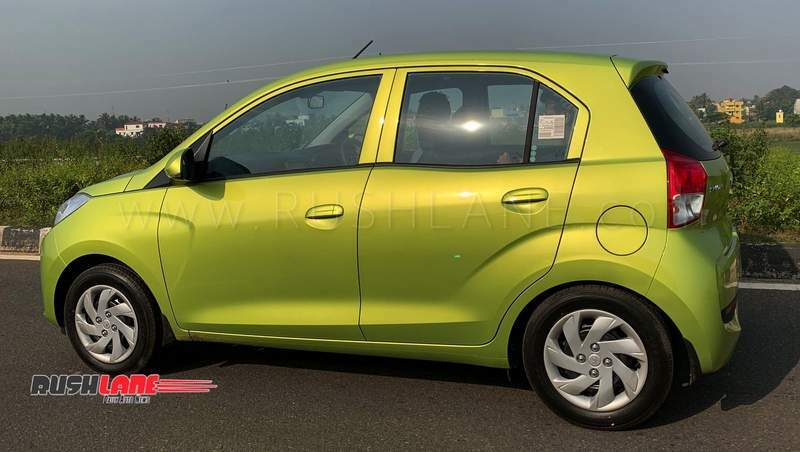 Ranging between 3.89 (DLite) – 5.45 (Asta) common ex showroom price all over India, the Santro comes with a many class leading features but also misses out on many. Also offered as in CNG and AMT options (Magna and Sports only) the mid trim seem to be the best proposition. At 5.69 ex showroom, the Tiago offers a lot more features and a bigger engine while the top end Celerio with AMT slots in at 5.53 ex showroom. Compared spec to spec, the Santro may seem a bit over priced for all that it has to offer but also comes with the brand name that has established itself so well amongst Indian families. Tiago is definitely more value for money, but Santro is much better quality.